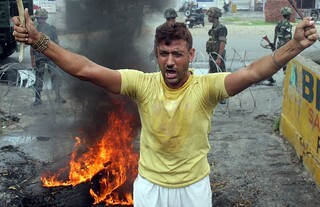 Protester, infringing the curfew shouts slogans against Jammu and Kashmir Governor NN Vohara in front of burning tyers during a protest in the Northern Indian city of Jammu, the winter capital of Kashmir, 05 August 2008. Two policemen were lynched in Jorian in Jammu and Kashmir as violence flared up on the Amarnath issue with protesters torching police posts and vehicles and uprooting 1.5 kms of railway track in the Jammu region, leaving 51 injured. 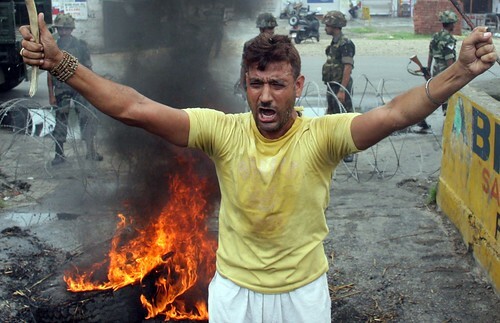 The Indian Army was called in to help the administration in maintaining law and order after violent protests over the Jammu and Kashmir governments recent decision to cancel the transfer of 99 acres of land to a Hindu shrine in Indian Kashmir.